Today is the wedding day of Prince Harry and Ms. Meghan Markle, an enchanted, fairy-tale wedding being touted in the shimmering adjectives usually reserved for Disney’s Magic Kingdom copy-writers. I wish the couple all the best for an event that has, thus far, been more Mr Toad’s Wild Ride than Cinderella’s crystal coach. 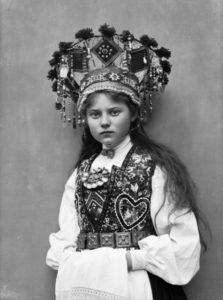 On that slender and tenuous peg let me hang my post on fairy-tale-wedding magic—a look at the legends of how Scandinavian wedding crowns, said to be owned by huldre-folk, ended up on the heads of human brides. 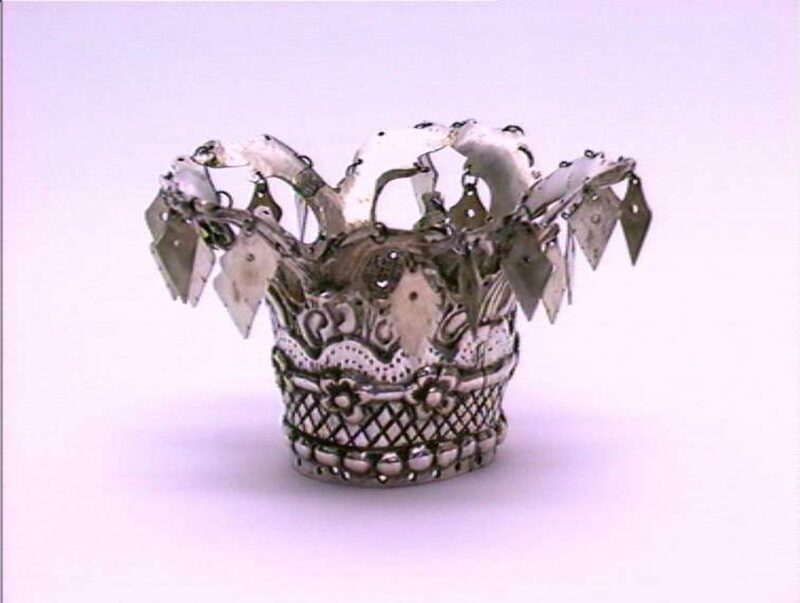 The crown symbolized the bride’s purity. Widows, wantons, and pregnant women were not allowed to wear the crown, although it was suggested that a bride with a bun in the oven could atone by making a donation to the priest or paying for a crown’s refurbishment. It was insinuated by the virtuous that crowns increased in size and splendor directly in proportion to the number of erring brides. 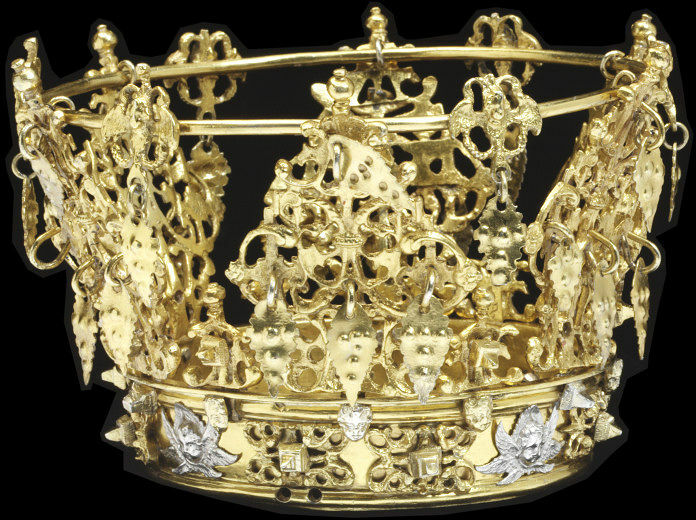 Crowns were passed down in families and churches owned crowns (as well as brooches and girdles) that could be worn by parishioners. You can see what appear to be shared crowns on different brides in these photos. Despite the church’s dangling of a pretty crown as a way to keep maidens from romping in the midsummer twilight, they were not the exclusive property of the Christians. 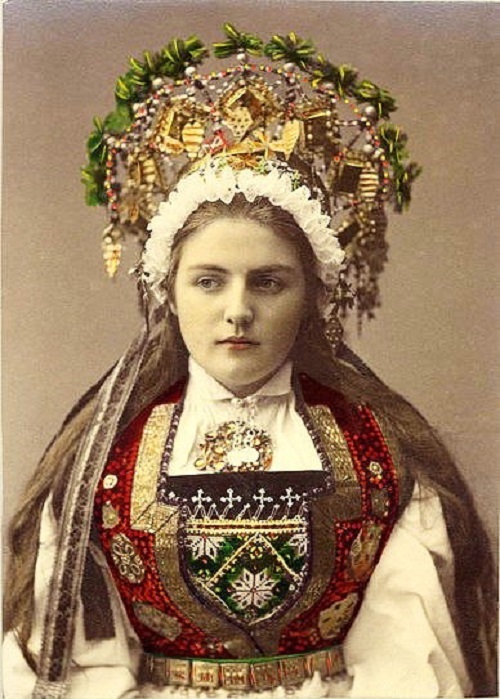 If the old tales are to be believed, supernatural creatures like the huldre-folk, too, possessed wedding crowns. And why not? Hulders were believed to have storehouses of gold, silver, and gemstones in their subterranean dwellings and to be clever metal workers. And every bride, even a fairy one, wants to feel like a royal princess on her wedding day. Like fairies in Ireland and Scotland, the huldre-folk are said to aggressively abduct and seduce humans in patterns of behavior that suggest an urgent need for a #FeeToo movement. One explanation for this sociopathic behavior is that huldre, like some fairies, long for Christian salvation. Some authorities say that the huldre-folk are fallen angels and beyond redemption; others hint that they are the “hidden” children of Eve or Lilith and interbreeding with humans will give them the necessary prerequisite for Heaven: human blood. An Irish priest happened upon a group of musical fairies who asked if they had any hope of salvation. He told them “If you have any drop of Adam’s blood in your veins, you have as good a chance of Heaven as any man, but if you have not,then you have no right to Heaven.” Whereupon the fairies begin to wail and moan in despair. Sadly, we learn no more about this useful headgear. Engaged girls, in that liminal state between maidenhood and marriage, were particularly vulnerable. A male huldre (or, more properly, the huldrekall) would assume the appearance of a young woman’s betrothed and suddenly she would find herself swept into preparations for a troll wedding, bewitched by huldre glamour. Every summer a long long time ago, they went up to the seter [mountain farm with summer pasturage] with the cows from Melbustad [Melbostad], in Hadeland. But they had not been there long before the cows became so restless that it was downright impossible to control them. Many girls had tried herding them, but it grew no better until a girl who had just plighted her troth came to work for them. Then the cows were calm right away, and there was no trouble herding them any longer. She stayed at the seter alone and had no other living soul with her but the dog. One afternoon, as she was sitting inside the seter, she thought her sweetheart came in and sat down beside her and started talking about having the wedding right away. But she sat quite still and did not answer a word, for she seemed to feel rather strange. Little by little, people began to come in, and they started setting the table with silver and food, and bridesmaids carried in a crown and a beautiful wedding gown which they dressed her in; and they placed the crown upon her head, as they usually did in those days, and rings were put on her fingers. She thought she knew all the people who had come. There were women from the farms and girls her own age. But the dog had certainly noticed that something was wrong. It ran away, straight down to Melbustad, and there it whined and barked and gave them no peace until they followed it back again. Then the boy who was her sweetheart took his gun and went up to the seter. When he came to the yard , it was full of saddled horses standing around. He sneaked over to the cottage and peeked through a crack in the door at those who were sitting inside. It was easy to tell that they were trolls and huldre-folk, and so he fired the gun over the roof. At the same moment, the door flew open, and one ball of grey wool after the other, each one bigger than the last, came rolling out and wound itself around his legs. When he got inside, the girl was sitting there dressed like a bride. He had come in the nick of time. Only the ring for the little finger was lacking, and then she would have been ready. “For Christ’s sake! What’s going on here?” he asked, looking about. All the silver was still on the table, but all the good food had turned into moss and toadstools, and cow dung and toads, and other things like that. “You should ask!” said the girl. “You’ve been sitting here talking to me about the wedding all afternoon. That tantalizingly specific reference to the wedding finery! Was it hung in the church, like a votive offering or a crant? If the legendary crown and wedding dress ever existed or still exist, I could not locate them. 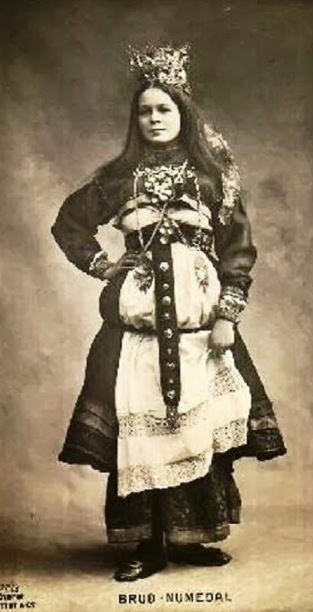 Wedding crowns were not the only bridal articles gotten from the Huldre. This young woman got a lovely gown from an old Huldre-woman with considerably less fuss than the young woman in the story above. This next story is very similar to the story from Melbostad, and echoes the detail about the huldre’s real, wooly appearance. The Interrupted Huldre Wedding at Norstuhov. Elli Bakken was up against the huldre-folk one summer before she was married. She was a dairymaid at Norstuhov, and was up at the seter. They usually had a loom along with them at the seter in those days, for this was over a hundred years ago. One day, as Elli was sitting by the loom, her sweetheart came in and said that he wanted them to get married right away. She was to come with him now, he said. She stared at him and did not know what to think. Then she saw the dog standing there glaring at him and growling, and she began to have her doubts. “I’m still my own mistress!” she said. But then there was a rumbling and a humming outside, and in came a whole crowd of people. And among them were two slightly older women, who stood out a little from the others, and it seemed to Elli that they looked at her so mournfully. “That dog of yours certainly doesn’t like people,” said one of them, and gave her queer look. “I think it’s best you let it out,” she said. Then Elli understood what the old woman meant. She took the dog out in the woodshed, tied a red ribbon around its neck and whispered, “Hurry home, Rapp!” And the dog set out. She would rather have gone with it, but they came out and got her and started dressing her as a bride. One of the old women fastened a big filigree brooch on her breast and whispered, “Just keep calm, help will soon come.” Then Elli remembered that two girls had disappeared before at this seter, and she understood that they must be the ones who were trying to help her, and so she let them dress her as they liked. Down at Norstuhov, Anne, the farmer’s wife, saw the dog come tearing along with the red ribbon fluttering behind it. Reier shouted to the boy to saddle the horse as fast as he could so they could rid to the seter, for something was wrong up there. He himself took the gun, and the boy took the ax, and they set out as fast as they could go. Up at Notasen, Lars sat fixing the roof of his stabbur, [store house] when he saw the two of them come riding by for dear life. “What’s up, now?” he said. Well, well, thought Lars, I can’t say no; and he took his gun and went with them. A little way up the ridge they tied their horses and went on foot, for it was so steep that they would get there faster without a horse. Soon they were at the seter. There stood a long row of saddled horses. Inside the cottage Elli was already dressed as a bride, and the table was set with all kinds of food, the way it should be for a party. But Elli sat there turning hot and cold, and stared out through the window. “Aren’t we to be married soon?” said the one who was to be the bridegroom. “No, you’ll have to wait a bit,” said one of the old women. Then a shot was fired over the roof. “Cross in Jesus’ name!” said Elli and crossed her hands over her breast. The huldre-folk tore off the bridal finery as fast as they could, but they could not take the big silver brooch because her hands were crossed over it. Then they rushed out of the door like balls of grey wool, and Elli was saved. Too bad she didn’t snag the crown as well. 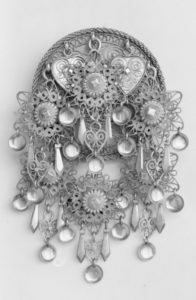 Large brooches were also a feature of Norwegian wedding attire. I’ve seen it suggested that the large amounts of metal in the crown and brooch and girdle were supposed to keep off trolls. 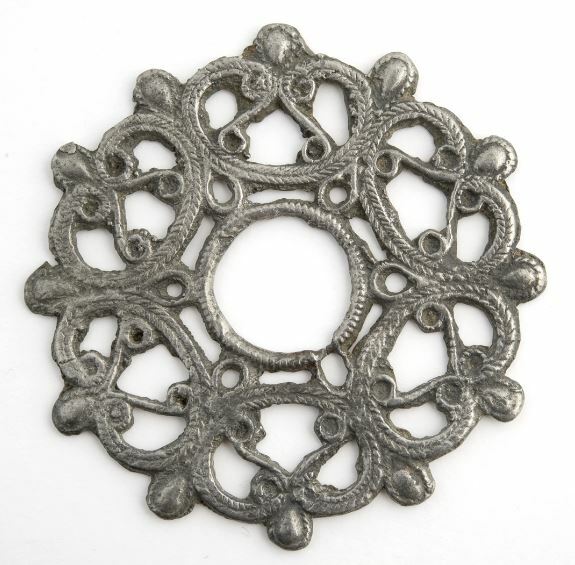 Looking at the filigree and knot patterns in some of the brooches, they may have also had apotropaic powers as well: perhaps a supernatural entity would have to trace the pattern before claiming the wearer. In this story and the one from Melbostrad, the motif of the huldre-folk rolling about as balls of grey wool, conjures up the infamous rolling wool bogeys of England, first identified by Dr Beachcombing. This curiously domestic image seems to recur in stories of the Fae. Another way to get a lovely bridal crown was to kidnap a Huldre-maiden from her own wedding party. 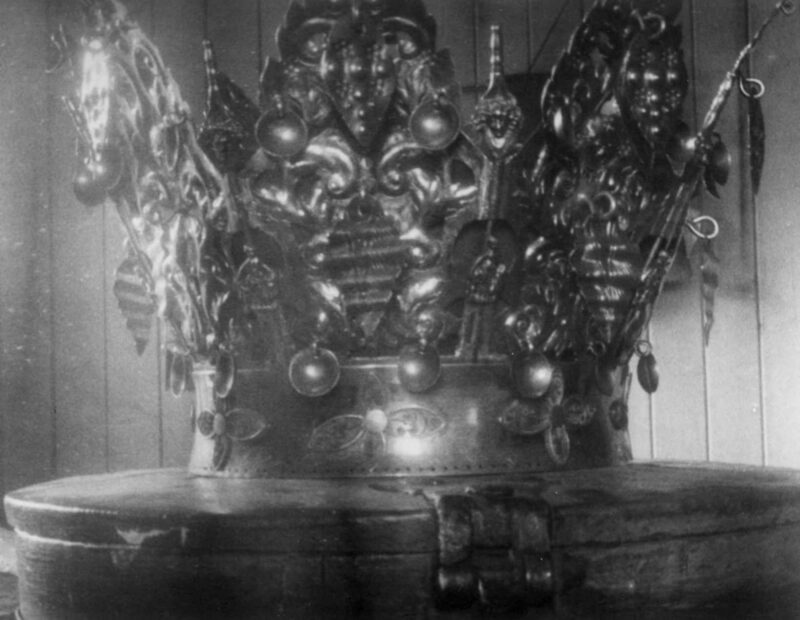 It is possible that one of the three Numedal crowns above is the actual crown said to have been captured from the huldre bride. I have not been able to locate crowns corresponding to those of Melbostad. I wonder why these huldre legends were attached only to certain crowns. Was there something peculiar about their design? Were they unusually old or had they been previously used to crown a statue of the Virgin Mary, giving them a supernatural aura? Possibly there are local place name associations that would indicate that they came from districts specially infested with huldre-folk. And are there stories of the huldre-folk leaving behind goods like shoes or spades, as Irish leprechauns do or did they only deliver wedding finery? It has frequently been said that alien and fairy interactions with humans are virtually identical. The huldre-folk seem just as obsessed as the Greys with seduction and kidnapping, although they are more eager than the reluctant aliens to commit to marriage. And it is a sad commentary on the loss of the old traditions, that today’s alien abductors leave behind only burning rashes and implants instead of wedding clothes of gold embroidery and silver bridal crowns.